I bought my first comic book in a shopping mall comic book store outside of Pittsburgh, PA. It was my freshman year of college, and I’d just made friends with a guy who shared all his torrented comic files with me. I was voraciously reading everything he gave me, partly to impress him, partly because it was free, from The Avengers to Batman to an obscure little series called Poison Elves. But the Hellboy trade I bought in Pittsburgh gave me something different than anything else I’d ever read. Called “The Wild Hunt,” it was steeped the in folklore and history of England in a way I’d never seen done before. I’d already seen the two movies with Ron Perlman as the heavy-handed big red hero, but I was still a nascent comic book nerd. Now, with my bookshelf overflowing with graphic novels and punk rock anarchist comics, I can say without hesitation that Hellboy remains one of my all-time favorites, with it’s combination of folklore and pulp, the occult and the mundane, a study in psyche and comics. 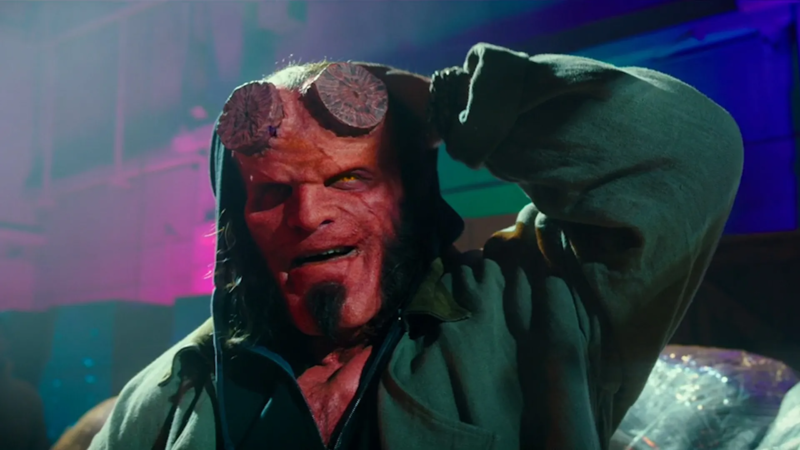 Which makes it hard to say that our newest addition to the movie franchise, 2019’s Hellboy, was a hard movie to watch. I say this as an avowed fanboy and a movie critic. I say this with as much love as possible for actor David Harbour, for the director, Neil Marshall, and the B-horror genre as a whole. It’s not an easy thing for me to admit that I struggled with this movie, and I’m still unpacking why. For Star Wars fans, it’s easy to rip the recent movies a new one. For Game of Thrones readers, it’s not difficult to say the book is better. For various nerd franchises, the diehards and the fanboys can write a thousand articles, complaining, re-imagining, bullying the movies they love and hate. For myself, it feels difficult. I have a strong emotional connection with Hellboy, rooted in that first purchase. I wanted to love the movie so very much, despite my friends’ warnings that the trailer looked suspicious, the special effects seemed not so special, the movie probably wouldn’t be better than the first two. They were right. Hellboy is messy, a string of gory scenes and as little exposition as possible. The writing is depressing, as it shifts between characters who are as edgy as British post-punk young people can be, to giving Hellboy’s character the tone of a late-eighties American teenager. The plot is a mashup of nearly four different Hellboy comics (and at least one or two B.P.R.D trades, too). These are all things other reviewers have said, all things the audience will acknowledge when they see it. And it makes sense. Talented as he is, Neil Marshall is still a B-horror director who happens to make other things. Articles have been written about how much friction there was during production, filming, writing, etc. Much of the film feels poorly edited, or even as if it wasn’t edited at all, like they just filmed it straight-through, scene to scene, from beginning to end. Whether it merits it or not, I want to be charitable with Hellboy. The comics have been around for more than 25 years, and the narrative is pretty well known. So the story doesn’t waste time telling us what we already know, with backstory or with the ongoing plot. Any comic book enthusiast with a cursory understanding of the Hellboy universe will not be at a loss for understanding. So “damn the exposition, full-gore ahead” seems to be the operative idea. The audience is treated to as many impalings, dismemberments and decapitations as can be mustered over 120 minutes. And it’s kind of cool to see comic book action come to life in a strange way, to watch Mignola’s rich artwork interpreted in a different way for the silver screen. And you can’t understate the ambition of this movie. It’s rebooting a franchise that did fairly well for itself, replacing one stellar cast for another, and rushing the whole thing through in under two years. Hellboy is covering narratives that took years for the comics to cover in a two-hour span. And, like other comic book movies made for adults, it tries to address contemporary issues. There is a brilliant (yes, one part of this movie can be considered good, calm down) scene in London, where Hellboy and Professor Bruttenholm are arguing over the war of humans and ‘monsters,’ for lack of a better term. Hellboy wants to know what happens next, after Nimue is defeated. Bruttenholm’s answer is they move to the next fight, and the next one, and the one after that. The Bureau for Paranormal Research and Defense, after all, is about defending humanity. We don’t see much of them or their shadowy British counterpart, M-11, in this movie, but we get a marvellous critical conversation about the futility of war, about mutually assured destruction and the search for a world where cohabitation is possible. Something like this doesn’t happen in every action movie, and it’s worth paying attention to. Yes, the movie is, for the average moviegoer, bad. But for the comic book fan, it does give some thrills, especially in the three post-credit scenes (I’m not going to spoil them, they’re just too good). Does that mean every comic book fan will love it? Of course not. I was sitting next to two fairly typical male fans, bearded and black-shirted, who spent most of the credits talking about what the movie should have been. Much as I wanted to agree with them, to join in their ribald commentary, I couldn’t. Even though I know this movie didn’t give me the closure I wanted, after 10 years of waiting for a third Hellboy instalment, and even though it could have used a pretty thorough rewrite, the way it exists now is a sort of palimpsest, a unique artifact overlaying the original. And the point of the palimpsest is not whether it’s good or bad, it’s that it exists.